Description: Looking at CN #5627 through some brush, as it idles in Niagara Falls Yard. 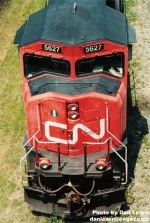 Description: The nose of CN #5627. Description: NS 41T rolls through Conklin, about to enter CPs East Binghamton yard. It will roll through to a crew change at QD, then run the Tier to Buffalo and a CN connection. CN power handles the train, as it does most days. Description: The 41T that just met 40T has a new crew and is rolling across the Chenango River on its way to Buffalo. Description: Most of the photos you see of trains on the Chenango River bridges are from the Clinton St bridge, or nearby, since thats the sun side, most of the time. There are limitied opportunities to shoot a photo on the other side-late in the day, or early morning in the summer, or on cloudy days. Ive taken advantage of Binghamtons legendary gray skies to get this shot of 41T with old and new EMDs crossing the Chenango, seen from McDonald Av on the north side of the bridge. Description: CSX 4811 is on the point of Q-438 at Ridgefield Park, NJ 10/29/2005. Description: 5627 and a CN GE wait for train at IHB Burnham Yard in Burnham, IL. Description: After a fine morning of train chasing, it was a long shot to head over to Bethesda Road crossing on the way home. I lucked out with this 7-engine lashup. What a way to end the day! Description: CN 5627 leads a WB autorack train at Scott Lake Rd.